Vertically boarded 57mm thick solid timber cladded external door with a styro panel core for improved thermal insulation. 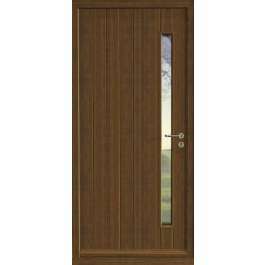 - Complete pre-hung made to measure front door set manufactured to a stuctural opening size of up to W.1020 x H.2100mm. We are able to manufacture door sets into significantly larger structural opening sizes including single and double side screens, top storey lights and double door sets. Available upon request. - Idigbo boarded 57mm thick front foor. Other timber species including Accoya, Iroko and European Oak are available (this may incur additional charges). For customers with budget constraints this design of door can also be re-produced using a laminated engineered core with a ply face, engraved to the Timka design for painted finishes. This method will reduce the cost without affecting the quality or design of the door. - 115mm pre-hung section frame including conventional 40mm Iroko cill, Stormguard slimline mobility threshold, timber weatherbar, Aquamac 21 weatherseal available in brown/black/white. - Glazed vision panel: 26.4mm clear double glazed units, laminated and toughened, low E. Other types of glazing available upon request. - Complete set of ironmongery including: security hinges with studs, multipoint locking system, standard lever handle, 180 degree door viewer, door security chain. Other ironmongery and locking systems, including pivot doors available upon request. - Factory pre-finished in a large choice of stains or paint finishes to a RAL/BS colour. NB: All timber is sourced from verified managed and sustainable sources. Delivery anywhere within the UK, cost excluded from base price. Lead time varies between 6-8 weeks from order confirmation.